I just came out of dinner, we had a steak night with wine. It is surprinsing how quickly I have settled in, and it already feels like home. I feel I have been here for weeks, where as this is only the second full day. Being a Saturday means I have had my first chance to see how the base relaxes. This morning was more training, this time driving ski-doos and learning to “co-pilot” a plane. More just a case of giving the pilot a hand. But interesting never-the-less. We had perfect weather to go for a drive in the ski-doos. The view from on top of the ramp was brilliant, despite some cloud rolling in, the icebergs still look magnifigant in their frozen isolation. The weather does change quickly, this morning it was still warm, about -7C with some cloud. But over lunch the wind picked up and by the afternoon we had 25 knots of wind. I signed up for a crevasse trip. 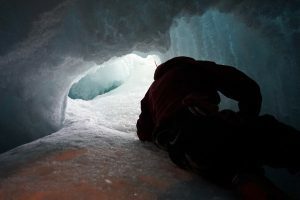 I have tried to avoid falling into a crevasse all my life, so I was keen to see what the inside of one looks like. I wrapped up warm, expecting it to be like a freezer, and we were fitted out with mountaineering kit. I am thrilled by all the experiences we are getting. 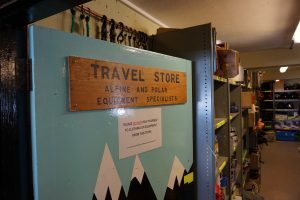 The kit store has everything we need, and we have amazing guides who can not only competently lead us but are good at fitting out and maintaing the kit, and patiently explain its use to us. That’s a big difference here. Not only are people good at their job, but they are happy to help others. I have done so much in just two short days, things that would normally require going on specialist courses to learn, and I am very thankful that I am so lucky to be here. 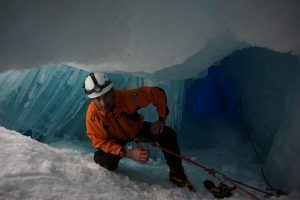 The pictures above show the crevasse. We had to slide down quite a deep and narrow hole and it was a little worrying, especially when you know that this ice is living stuff, it moves and compressed, and is never really still. But I have complete trust in our field guide and they have already set up the ropes. 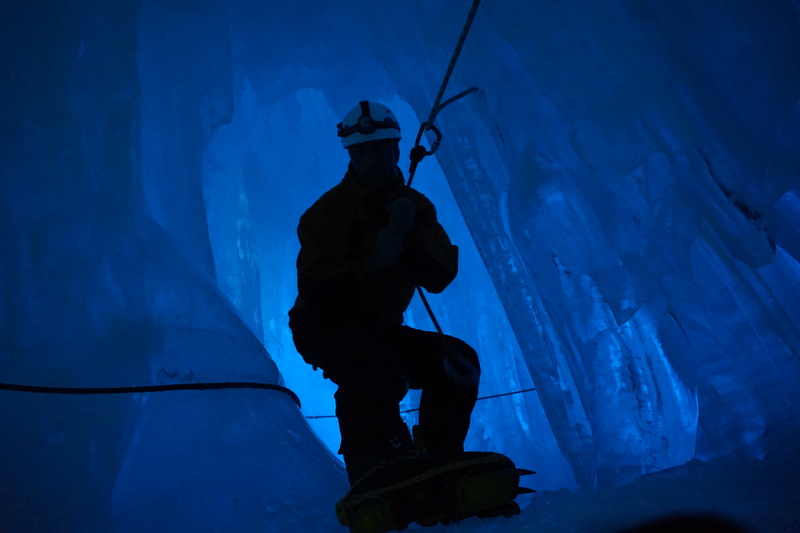 Down below, without a torch, the ice glows an eery blue. I double check that there is not a torch set up below, but it really is sunlight filtering through 10s of meters of snow. The icicles are as thick as a man’s waist, and extend several meters from floor to ceiling. Some are deformed from the slow and unrelentless pressure above. I try not to think of the tonnes of snow and ice above my head. It must be stable, right? Otherwise we wouldn’t be allowed in here. 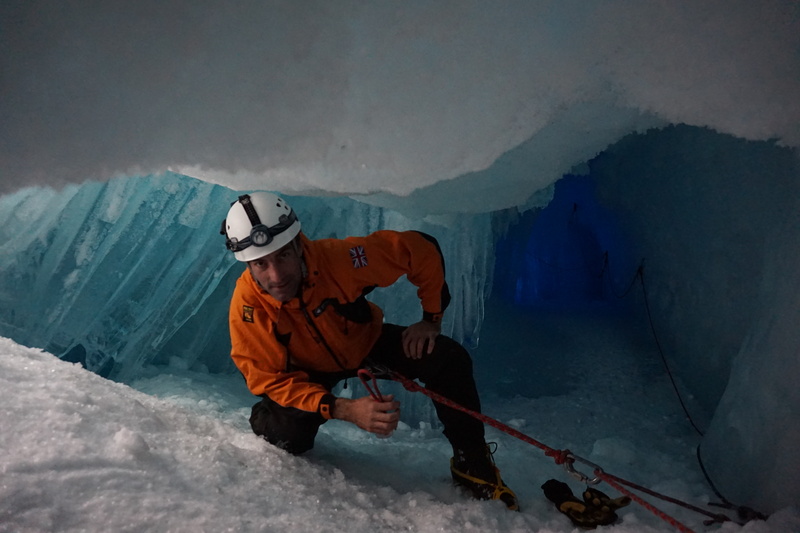 Also we are clipped to a horizontal rope, yet we are walking on what appears to be a solid floor of ice. I rememember the glaciers I have crossed in the Alps, and I realise the clipping on is probably necessary; this crevasse could drop another 80m below me and I might only be standing on a snow bridge. Our guide explains to us the beautful hexagonal ice crystals that hang from the ceiling are only created because the crevasse has been opened up and that has allowed warm air in. 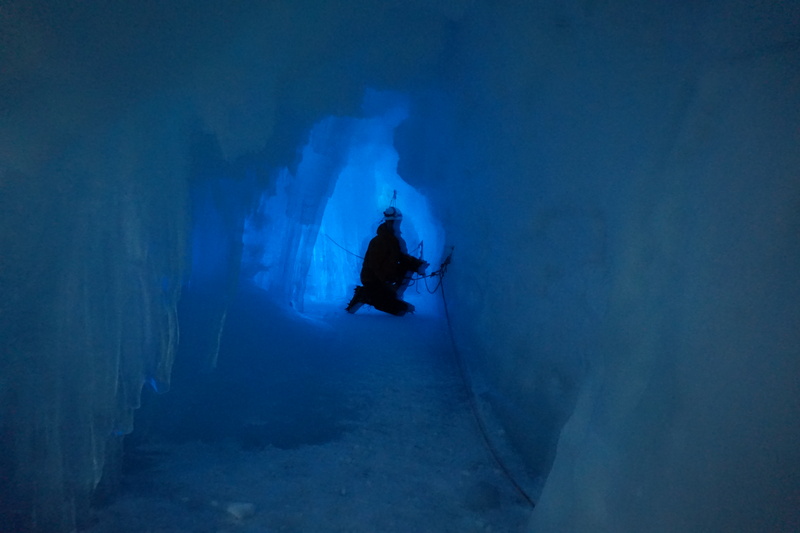 I can see ropes frozen into the ice below, where previous years trips accessed deeper in the crevasse, but warm air introduced down here has cause a melt-thaw cycle, effectively drowning the previous years’ paths in ice. I take as many photos as possible, everything down here demands it. We squeeze through narrow gaps, and the crew’s headlights create stunning visual effects. Eventually it is time to leave, so we climb out of a second hole, and stomp back to base. It is clouded now and the weather has turned. 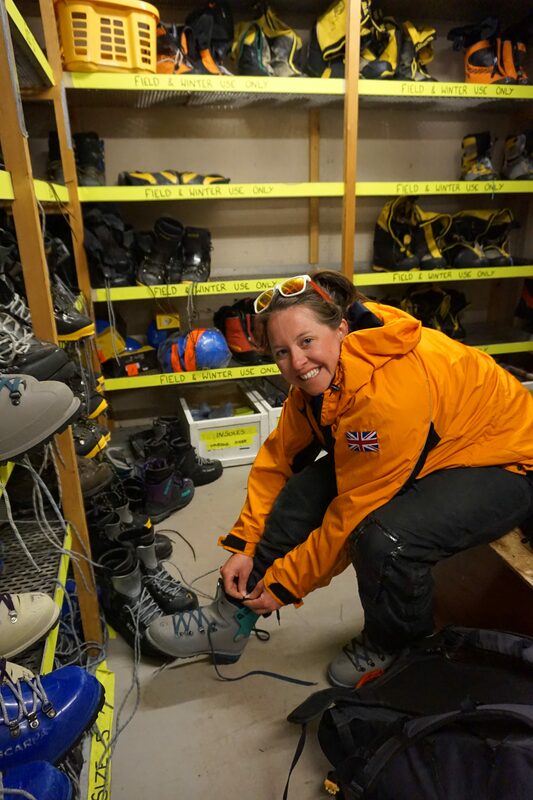 I am happy to be heading to a warm base with a shower and the chance to get a sleep before dinner. I awoke to some comotion in my corridor. Ah! It’s Saturyday, that means formal dinner time. I don a shirt and head out. People have left an iron in the corridor, clearly this is an important occassion. We are in the dinner hall, and it has been laid up for a proper dinner. However, everyone is still keen to help. It is not a case of “someone’s on duty” or only the kitchen staff clean. Here people are keen to show that they will help, serving and cleaning. From the base leader to the chief pilot. No one is proud. That’s it for tonight. I am off to drink beer. I have uploaded some photos for “photo of the day” – maybe our crevasse trip will make the esteemed screen in the dining hall tomorrow?